My eLearning Guild Online Forum Session About Voiceovers is Now Available For Free! I was delighted to receive a note today from Chris Benz, Director of Online Events for the eLearning Guild, letting me know that they’ve selected my presentation from last week’s Online Forum as their latest free sample of the kind of quality content that comes with Guild membership. I’m thrilled that my session was so well received, and am very glad that now you can watch and share this session even if you’re not yet a member of the eLearning Guild. Of course, if you’re in the eLearning industry, I would strongly encourage you not just to join the Guild, but to become an active member and share your own interests and expertise as well. I’ve found each of my experiences with the Guild to be great fun, and as always, my students/audience teach me something as well. The session I presented last week was the opening keynote talk for the Guild’s Online Forum about incorporating Audio and Video in eLearning. My session touches on the basics of how you can use quality voiceovers to add that powerful “Human Factor” to self-paced learning content, as well as on how and when you might consider using human versus synthetic (or automated text to speech) voiceovers. The recorded session is 75 minutes, including the various polls and chats, which are an organic and important part of the content, as that’s how attendees participated and shared their own great and thoughtful input. To view the session, click the Guild logo on this post, and you’ll find a link toward the bottom of that landing page. I hope you enjoy the session, and I hope you’ll come back to this site and share your own ideas and suggestions as comments to this blog post! My thanks again to Chris for inviting me to speak, and to Karen Hyder for her excellent support throughout the process. I’m Giving the Opening Keynote Talk at the eLearning Guild Online Forum on July 21st! Sorry not to have posted this before now, but it’s been a surprisingly busy summer! I’m very pleased to announce that the eLearning Guild has asked me to be the keynote speaker at the opening of next week’s Online Forum about media in eLearning. My talk will be 11:30 AM Eastern, and then they have two days of great sessions about best uses of audio and video in eLearning courseware. My talk is entitled The Human Factor: Making the Case for Voiceovers in eLearning. I discuss the importance of the human voice in online training, and how much or how little to use. I also explore the pros and cons of voiceovers created by real people (whether professional actors like me, or subject matter experts) versus the new wave of enhanced synthetic text-to-speech voices available in today’s marketplace. If you’re in eLearning and not already signed up for the Forum, I urge you to click the image on this post, and explore all the offerings that you won’t want to miss. I’m very eager to sit in on the other presentations over the two days, as using media effectively in eLearning is more important than ever. My E-Learning Voiceovers Program Was a Great Success! If you’ve read any of my recent posts, you know I was asked to teach a full-day pre-conference certificate program on How to Create and Deliver e-Learning Voiceovers Like a Pro for the eLearning Guild’s Learning Solutions 2011 conference. I had 13 wonderful students from across the U.S. and Canada. I had designed an extremely hands-on program, which gave everyone lots of opportunity to practice new ideas and tricks as I taught them throughout the day. We worked on writing and rewriting scripts to turn them into compelling voiceover copy, we worked on basic relaxation exercises and vocal techniques, and we worked on the essentials of recording and editing voiceover files. Then I held an extended lab in the afternoon where participants worked on creating scripts and audio content while I walked around the room, working one-on-one with each and every student to answer questions and provide suggestions and guidance. At the end of the day, each student did a mini-presentation, playing and discussing the difference between audio files they created first thing that day, and then again at the end of the day, using the same script. The improvements in every case were audible and substantial. I was proud of all the students for the progress they demonstrated in the space of just one day! I was also both pleased and humbled when I read all of the anonymous student feedback the following day; it means a lot to me to have made such a positive impact with my teaching. I salute each and every one of my students for working so hard, and for doing such a great job! NOTE: If you were one of my students, and would be willing to let me put your “TakeOne” and “TakeTwo” files (either anonymously or with your name, as you please) into a little mini-presentation I’m thinking of creating about the class, please contact me. It will likely include a very brief overview of the topics, some of the written feedback, and audio samples. There’s no better evidence than the great work produced in class that day! My thanks to Heidi Fisk of the eLearning Guild for inviting me to teach again this year. It was a fantastic experience, and I’d love to do it again. In the meantime, I do coach on eLearning voiceover skills one-on-one, or for a team; you can find more info on my Coaching tab. Learning Solutions 2011 Is Next Week! The eLearning Guild’s Learning Solutions 2011 is almost here. Next Tuesday, I’ll be presenting my full-day certificate program on voiceovers for eLearning. And on Wed-Fri mornings, as part of the Morning Buzz agenda, I’ll be presenting my 1-hour discussion and coaching session on Presentation Skills. If you want to sign up for my voiceovers hands-on workshop, you should contact the eLearning Guild immediately to see if any spaces remain. My Presentation Skills sessions will be open to all. Click the logo on this post to visit the Learning Solutions 2011 web site. If you’re registered for my voiceovers workshop and have any questions that need answering before the event, now is the time to post here on my site and I’ll reply as promptly as possible. The e-mail I sent via Juli Balding, and my other posts on this site, should answer most questions. 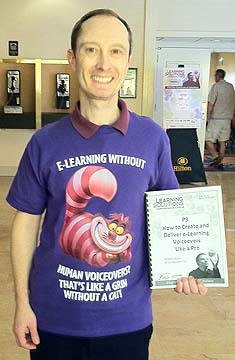 I’m very excited about leading my full-day certificate program in eLearning voiceovers next week (3/22) as part of the special pre-conference offerings of the eLearning Guild’s Learning Solutions 2011 conference in Orlando, Florida. The indefatigable Juli Balding at the Guild sent me a note on Friday that my session looks like it will be full! Those of you attending my program should have received an e-mail from me via Juli outlining how we’ll be spending our day together, and talking about the equipment you need to bring with you. If you are registered for my session and haven’t received that note, please contact Juli or me immediately, as it’s important for you to have all that information in advance. On registrant has asked how I feel about headset mikes, and my answer is: I think you should use something better for eLearning voiceovers. Good USB mikes are available for under $100 these days. That said, bring whatever mike you choose; I’m just offering my opinion based on my own experience. So, if you’re attending, what will we be doing that day? We’ll be working on a mix of skills. First, we’ll look at what makes a good eLearning voiceover script. And then we’ll work together editing samples I’ll provide, and writing new samples, and hearing how the new versions sound. Then we’ll focus on your voice: we’ll cover the very basics of how the human voice works, and practice some very entertaining exercises together that will help improve both your diction and your delivery. We’ll also go over some key tips & tricks for delivering an engaging “performance” in a voiceover. We’ll spend a little bit of time going over the basics of getting yourself ready to record, and then we’ll break for lunch! After lunch, we’ll go over the essentials of voiceover recording and editing (we’ll be using Audacity, the free audio software program, but this is not an extended class on how to use Audacity!). Then, I’ve arranged a generous time slot in the afternoon for you to practice recording voiceover more voiceover samples. I’ll be walking around the room, and working with each and every participant one-on-one on whatever area they feel they most need input. At the end of the day, we’ll each share a sample of the work created during the day. The tone throughout will be communal and constructive, and we’ll have a lot of fun while we’re at it. Our day will be part writing/editing boot camp, part The King’s Speech, part techno-tweaking, and a lot of practice–it’s going to be a full day! We will be in the Kahili/Lily room on the 2nd floor at the Disney Hilton. As mentioned in a previous post, based on the success of the introductory eLearning voiceover sessions I offered at two eLearning Guild conferences in 2010, I’ve been asked to offer a full-day certificate program on the topic as part of the Learning Solutions 2011 conference. I’ll be offering my workshop on Tuesday, March 22nd, from 8:30am-4:30pm at the Walt Disney World Hilton in Orlando, Florida. To learn more and to register, click the logo on this page. Because I want to have all participants actively involved and working throughout the day, and so that I can give each participant personalized feedback, I’ve told the eLearning Guild that I am only accepting a maximum of 15 students. I encourage you to register ASAP to reserve your place in this workshop. If you have been given the responsibility of recording voiceovers for your company’s internal eLearning projects, I can give you the confidence and skills to take the quality of your work to a whole new level. I’ll be posting more information on this blog between now and the workshop, and I will also be communicating directly with all those who register. If you have any questions in the meantime, feel free to post a comment on this site, or e-mail me directly. Sign up today and join me on March 22nd. And if you know someone else who should be taking this certificate program, spread the word! Reservations will be first-come, first-served. This past fall, I was contacted by Rick Rabideau, one of my former supervisors at MetLife, about consulting with him on his new solo business venture, Telivant. Rick’s new organization is currently focused on the real estate market, helping realty agents embrace technology to enhance their business. I agreed immediately; having bought and sold homes myself, and having worked with many realtors, I know that Telivant is addressing a pressing business need for the realty community. If you know any realtors looking to gain a new edge in this competitive market, you’ll be doing them a favor by sending them to the Telivant site. I’m doing a mix of instructional design, writing, review & critique–and will be adding voiceovers to one or more upcoming modules. It’s great to be flexing all these aspects of my eLearning muscles on a variety of Telivant projects, and I look forward to seeing the company blossom as it picks up momentum in 2011. Keep an eye out for it! Well, it’s official! Heidi Fisk of the eLearning Guild has asked me back for the 2011 Learning Solutions conference in Orlando, Florida. This time, I’ll be offering Breakfast Bytes coaching and discussion sessions on basic Presentation Skills each day, as well as a pre-conference full day hands-on workshop focusing on creating quality voiceovers for eLearning. Stay tuned to future blog posts for more details about both!